About two years ago, I quit my own company to go freelance. I was working on a huge project with more than 50 small Flash apps, but I left the project some months ago more or less out of frustration. It’s now more than three years since it was started and there’s still nothing I can show publicly. Well, I’ve not been sitting idle. I’ve made a kids game (with Netron) that has gotten rave reviews. The game was done in both Norwegian and English and it will soon get worldwide distribution in even more languages. With a fun storyline, more than 40 minutes of animation, 30 mini-games and a drawing program it’s a solid package of kids entertainment. The game targets kids 3-10 but should work well for childish grownups as well. 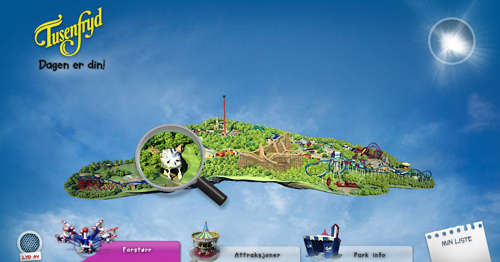 I’ve also done an awesome looking 3D map for an amusement park (also with Netron) as well as changing the backend of Flashmagazine to ExpressionEngine. I’ve also been working on an AS3 version of an Open Source project that I’ll get out the door soon. It’s lagged behind because of fun commercial work, but I’ll get it out within the end of next week. I’ve also gotten myself an office downtown Oslo, in Storgata 51, straight in between the town centre and Grunerløkka. I share offices with two product designers that has a really cool device, one designer as well as three architects. The architects website was designed by Junebug and I converted the design to ExpressionEngine and set it up. I’m yet again amazed at how flexible EE is. Every item written on the site can be associated with an architect and/or a project. If you look at an architects page, you can also see all the latest news for the projects they work on. Every project page also shows the news associated with it, so it’s effectively a full project history. Every project has a unique RSS feed so anyone can easily track the progress in a project with next to no extra effort for the one filling in the content in the CMS. Really pleased with how the site tuned out. Nice to know what you’ve been up to. Must now just get the FM design inline with the EE backend.